The name of the new skirmish game is Eternal Battle. There will be one set of Core Rules, 2 or 3 Twists and as many Settings as people are interested in playing in. There are 2 basic approaches to generic systems. In the first approach you have a single volume for each period and this includes the core rules as well as any period detail all mixed up together. I have chosen the other option which is to separate the core rules and the backgrounds. The reason I have done this is to retain the clarity of separation. Very often what happens in the first model is that there is a degree of creep over the years of development so that each period’s rules drift away from each other and become not one common generic set, but a series of close cousins. As they are all in their own books, often with different layout styles and so on, it becomes awkward to find and remember what the subtle differences are between versions. This doesn’t matter if you only play one period, but the point of generic rules is that you can play more than that without having to learn a new set every time. I also think that it muddies the waters in terms of development and leads to flabby design. Separating the Core Rules and Settings physically means that I can concentrate on the proper function of each book. These are a way to model humans fighting each other regardless of period or weaponry. People are people regardless of time and place, and the thin veneer of specific culture does not make as much difference to feelings and behaviours as might at first be thought. There are way more parallels than there are differences, which makes a common rule set possible. A separate Core Rules book has to allow for any type of weapon or formation and address different fighting styles across history. However, it does not need to deal with the details of each. Another big advantage of having a single volume of rules that is common to all periods is that any changes, corrections or updates that need to be made to the rules can be done entirely separately from the Settings, and only need opt be done once to cover all the bases. Think of the Core Rules as Eternal Battle’s engine. It is into this power source that you plug each of the Settings. Each Setting focuses on a single period of history (or fictional background). Some of these will be quite specific and others broader. Both are useful. In practical terms, the separation of rules and background into their own books allows me to concentrate on steeping each Setting book in the essence of what makes that period different. Mechanically, the Core Rules are built with a set of “sockets” into which each Setting can plug in their period-specific details. 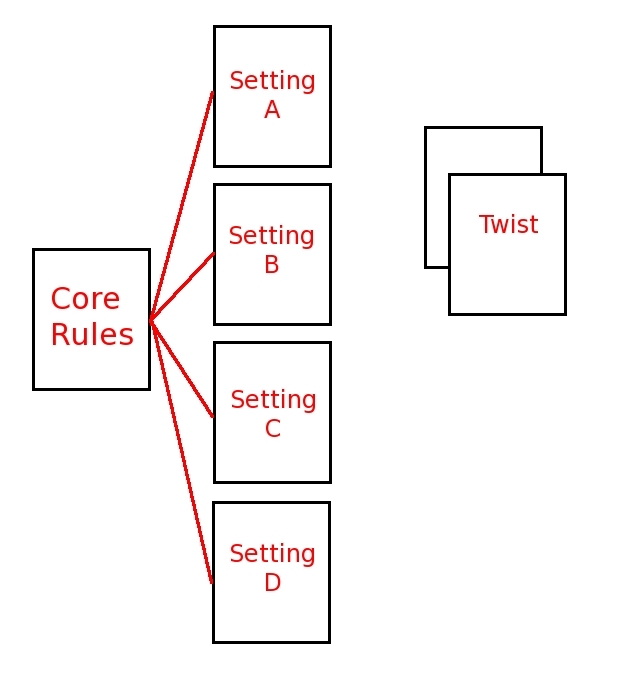 When moving from one Setting to another, the concepts and rules behind each are identical, though the content varies. Once you know how to play one version, you know how to play them all. This means that you can very quickly move from Ancient Greece to the fields behind Omaha Beach and then into space or back to the Norse fjords. The rules become invisible and you can concentrate on the game. The aim of a Setting is to provide character, background detail and specific period flavour so that a game of Eternal Battle tells a story that is appropriate to that time and place. Games in each Setting will play differently because the period-specific plug ins for the rules change the tactical options and victory conditions. There are a couple of things that really sit outside either Core Rules or Settings. Instead of applying to one period of history they could fit in many. I’ve called these Twists. So far I’ve thought of 3: Zombies, Alien Invasions and Time Travel. Time Travel obviously interacts with as many different times and places as you want it to, but needs a framework to make sense. Zombies and aliens are foes that could appear anywhen as well as anywhere, and so making them part of one specific setting is just too limiting. Why not have zombies in Napoleonic times? Why not Norse zombies? The same goes for alien invasions. This entry was posted in Eternal Battle, Quirkworthy Productions. Bookmark the permalink. Sounds fantastic and I can’t wait, now just get it released! Jokes aside, will it be limited to a certain scale? Although dice mechanics would work the same regardless, I can’t see a system with variable move and shoot ranges being easy to write and difficult to have to constantly calculate on the fly if its formulaic. Most skirmish gaming is done with 25/28/30mm scale figures and that’s what I’ve assumed will be the bulk of people’s collections and the main scale people (me included) will want to play skirmish games in. However, I’ve also played some WWII with 20mm models and some other periods with 40mm. 54mm would also work. For the 20mm I just left all the distances as they were (and it looked even better); for 40 or 54mm I’d double all the distances. Very simple and quick to do. The only thing stopping you playing with even bigger figures would be the size of your gaming space. For models smaller than 20mm there is no reason it wouldn’t work, perhaps halving the distances or using cm instead of inches. A sort of travel version, if you will. Of course, most people find that skirmish gaming is an opportunity to indulge in a bit more detailed modelling and painting because there are fewer figures required and they’re generally big enough to paint details on, and this kind of goes against the smaller scales. In short, the rules aren’t bound to any specific scale, and you should be able to adapt them to your model collection very easily. Sounds BRILLIANT, Jake. I can’t wait to try out Eternal Battle. I love your strategic thinking behind it and I agree with a comment you made in a previous post — we really do live in the Golden Age of Gaming. It is not without thanks to yourself that this is the case. This looks like a very interesting project.Its nice to see the thought process behind the rules, especialy when its from someone who knows what they are doing. This approach seem very logical and well thought though. My only missgiving is the ‘twists’ could give an imballance in technology which might negativley impact game play perhaps. But the Zombies sound like a cool edition to any game period.IMO. (I am right in thinking the ‘core rules’ just deal with how elements interact. Part of balancing twists will be engineering them to work with any tech level, which makes it harder to do like this, but I still think this is the best way to approach them. You’re right though – it is a challenge. The Core Rules deal with how people move, fight, shoot, order each other about, take turns, react to each other, plan missions, win games, as well as explaining how armour works and how equipment is classified, etc, etc. The specifics of what weapons they can use, which skills are available, what missions are appropriate, types of formation and so on are part of the character of the period and so belong in the Settings books. So, how a skill works is explained in the Core Rules; the skills you can have in that period are listed in a Setting Book. To go back to my previous analogy, the Settings plug sets of period details into the rules engine described by the Core Rules. I am hoping your system be compatible with Gladiators, Pirates, Knights and Ancient Greeks; these are the four areas that my miniature collection covers. Also glad to hear that the scale is variable — I actually play with 90mm-scale models! So far I haven’t found a period it can’t be easily adapted to. In terms of scale, 90mm is pretty big figures. Your only issue would be having a table big enough for the ranges of movement and missile fire to be convincing in comparison. I find that all the really cinematic stuff in skirmish games happens at close-range. My table is only 5′ x 3′ (not even that) which is very small for 90mm-scale, but I find this is large enough to achieve everything I want from the game. My gladiators are fighting in a small arena and my pirates fight ship-to-ship (albeit on very small ships). My knights fight in village squares or in the shadow of a watch-tower. In each case, there’s nowhere to run (except off the map), so it keeps things very tight and fast! Sounds fun. Kinda reminds me of GURPS, like an adaptable core system to apply to a multitude of periods/settings. Also seems like it would be a cool toolbox for players to come up with their own settings which is nice. You are right – GURPS did a similar thing for RPGs. I also expect people to add their own settings and tweak existing ones to fit their gaming group. I think that’s part of the fun. I always think that there are all manner of untapped possibilites with zombies. They are such a cool idea why not stick them in everything? At least, try it. Napoleonic undead could look really cool. IIRC Flintloque had one of their factions as undead (the Russians?). I don’t know if they are still around. Mind you, you could probably make much nicer models using Perry, Victrix or Warlord plastic Napoleonics and Mantic zombies. Plastics are dead* easy to covert. *No extra charge for the terrible pun. Looks interesting, I like the idea of it essentially being modular. Are you planning any campaign/experience rules? One thing I always liked about the Games Workshop skirmish games was the way that they always included experience and “warband” development rules and it something sadly absent from most of the more recent skirmish games. I’ve been thinking about this and am slightly torn about developing the forces in game. Campaigns and linked scenarios are a good idea and definitely on the list of things to include. Developing individual models sort of works and I’ll probably include it because I like the idea too. It is often a whole raft of extra rules though, and I’m keen to avoid overburdening things. Of course, one could always just play one offs, or campaigns where the sides didn’t increase in skill (worrying instead about whether losses from battle A can be replaced in time for battle B). “Warband” development is, I think, one of those elements which people like the idea of, but which is mostly discussed and thought about rather than played out for real. Mind you, that’s probably true of gaming in general. Way more time is spent (and enjoyment had) talking about gaming, planning things, finessing armies, and so on than is every spent actually gaming. Perhaps part of the issue here is the level of complexity, an a simpler and slicker system would encourage more people to try it out. Perhaps it’s more to do with such systems being presented as a separate add on rather than something integral to the way the whole thing works. If the assumption was that your men could grow in experience rather than that being an addendum would people use it more? Maybe the option is to not use it? I’ll have to think on this a bit more. Good question though. It seems to me Campaigns and linked scenarios where you did not have to organize a Campaigns, create linked scenarios or get everyone together for games might be a nice way to unwind in the evening. Lately I have been thinking of Warbands as their own character where adding a figure of X type to a Warband can change the character of a Warband with less effort/bookkeeping compared to character development. Twists, This could be very intestering. If the core is solid then perhaps adaptation could produce very different games where one could climb over buildings or perhaps ignite them. Perhaps action could be in the air, on or under water and lots more twists using the same basic mechanics. P.S. there are a lot of fantacy ships tucked away in a game that can never end. I’m a big fan of the development of individual models over the course of a “campaign” (or, rather, series of games). I’m not quite sure why, but I suspect it’s something to do with the way it links games together making them exist (in theory) in both a “now” and “tomorrow” – that is to say I have to try to think not only in terms of moves ahead, but perhaps games ahead. This adds to a sense that somehow each game has a mechanical “improvement” that I’ve earned and sets me in a better position in the next game (or turn, if one things of a campaign as a very long game). This is probably a roundabout way of saying that I think that experience rules are a huge bonus. Perhaps this is partially due to an association of these sorts of rules with low model count games, but it’s a bit draw for me. I’d certainly be interested to see your take on it, if you decided to include it. Would magic be setting specific, or a twist? A generic magic system would be great, if you could get one to work. Perhaps it could be generic with setting specific rules. World War 2 with magic anybody? Now that would be a skirmish game I’d love to play. @Delf – good question. It could be either, and I’m not sure where it would sit better. Jon’s notion of a WWII game with magic would need it to be a Twist, and it would allow any number of odd and intriguing combinations. What I am thinking at the moment is that a generic magic system could work as a Twist, but a fantasy Setting could have its own, different, magic system that was tailored to fit in with that background specifically. This kind of flexibility is one of the reasons I like this structure of books. All this talk of magic reminds me of the quote. So the thought crosses my mind that similar effects could be written for different settings. But they could be atributed to ‘magic’ in some settings but ‘correctly ‘ identified as more ‘advanced tech’ in others. In a similar way ‘telepathy and telekenisis’ and other psychic ablities , can be identified with scientific names in more technology focused settings.But atributed to strong belief being rewarded by deities in more faith focuesd settings. Just a thought that might allow Wizzards of WWII vs Aliens because that does sound so cool! I am not saying debunk the magic, in the’ magic settings’ with technologicaly minded explanations. But from a game ballance point of view it might be helpful to allow similar in game effects with setting specific explinations. Just a thought on basic characteristics and stats. Would it be better to have the offencive effects of weapons combined with the abilities of the user on the characteristic line.Eg break characteristics into defensive characteristics.And Offencive charateristics. I want to add more detail to weapon effects for a skirmish game, but keeing it relativley simple. The main thing I got out of a mailing list for a detailed firearms simulation system was the idea/insight that the main skill of a soldier isn’t “Hand-to-Hand” or “Shooting”. It’s “Combat”. You forgot zombies. And fishmen. The model I am using is much more along the lines of “combat infantry” being the skill. Of course, people can specialise within that, but in general you are able to fight (in the broad sense of coping with combat) to this level or that. I like the concept in Flames of War, where the recipient of the bullet determines the how difficult he is to hit. This is different to toughness rather it is guile, experience and cop-on to keep one’s head down. Ok, so it is interesting. I think many games set out to do one period and then get ported to another. Is Warmaster the best example of this with the command mechanic proving fairly universal? So instead you are trying to preempt the difficulties that come with such ports? I guess the proof of the pudding will be in whether you have nailed what the common theme of people skirmishing down the ages is. I personally have never found a universal system that I can take from genre to genre. Warmaster comes close, but I prefer Epic A (http://epic-uk.co.uk/wp/) for Sci Fi (with admittedly the force limitations it entails), King of the Battlefield (http://uk.groups.yahoo.com/group/king_of_the_battlefield/) for muskets. Skirmish as a genre has normally not been that satisfying (bar Crossfire http://crossfire.wargaming.info/ but that is still a higher level of organisational), with my last major set of games being in the rogue trader days, so i look forward to at least giving these a try and self publishing has the advantage of making these cheap to get! I second the comments on experience though. I know it is very hard to get right. The copy of Necromunda I won at a 40k tourny many years ago never impressed me and various games since have failed to convince. I know it is extremely hard to model a system where individual improvement is believable (people have funny ideas about what veteran troops are like for instance) within a certain timeframe and recruitment and attrition balance out over time. Also I am curious as to how the fight will end. The end of a skirmish is it seems, very hard to model. The motivations of the combatants, the setting, the belief in predetermination :), all combine in so many ways. Not least if you have an objective how does the game end? People magically melt away? Do you need to exit the board? How do you model the defeated sides desire to pursue? Finally do you want a system that can give unsatisfactory results, such as one side getting boxed in/getting nowhere, morale failing and fleeing with nary a shot being fired? In the past I have relied on GM’s to provide that judgement, be interested if you have a mechanical solution though. Your examples are mostly GW, but the principles of porting mechanics have been around for a long time. I always thought that Chaosium’s core RPG mechanics ported quite well between systems. You’re right about the modelling of combat in the core rules being key. WHat I’m testing out is not so much a series of different period specific sets, but a series of combat style approaches and technological variants. For example, armies with early rifles train their men to shoot accurately. Armies with muskets want to fire en mass in volleys. Modern armies are trained for weight of fire and suppression rather than expecting to fire at point targets with single shots. All of thee things impact not only the available weapons, but the styles of combat employed by the warriors that carry them. Common objectives in skirmish scale battles include capturing prisoners (something which is often forgotten in games), and simply scouting positions, observing for artillery or air, or spying out the land. “Kill them all” is not a normal goal for a specific mission, though it is, in effect, standing orders. Or more accurately, neutralise them all (which could include capturing them). Ending battles in general is an interesting puzzle, partly because the ends of battles are not especially well documented. Accounts tend to focus on the neat lines at the start when people have pre-battle plans to look at and when they know what the intent was. As things get increasingly scattered and confused, especially in modern skirmishes, it becomes ever harder to know where the front line is, never mind exactly what happened and how victory was achieved. It is not that uncommon for both sides to think that they won – another thing that doesn’t happen much in games. Playing linked battles is one of the better ways to make people behave more sensibly and to encourage a credible end to a battle (rather than force one mechanically). If people know that they won’t get many reinforcements then they have to salvage what they can from each fight. In other words, people learn to be in it for the long haul, not for a single fight – exactly as real warriors are. When you only play a one-off fight the temptation is to fight to the last man because it doesn’t matter. Of course, you could construct a victory points system that encouraged such behaviour, though people again tend not to. For Eternal Battles I’m using a combination of mechanics. Firstly there is the morale system where individual warriors decide that things are too dangerous and start to retreat (which is distinct from morale breaking). This bleeds resources away, potentially to a point where the position becomes untenable. Then there are differing motivations and abilities of troops – losing all the better ones may cause the whole force to grind to a halt. There are also objectives at a couple of levels and achieving some of these means that the force can retire, its job done. Also, as mentioned above, playing linked battles allows for models to gain experience and also encourages people to husband resources and retire before they are wiped out. What makes this so interesting from a gamers point of view is the fact that you have aset core of mechanics and can switch genres without so much of the hassle that comes with having to remember so many new systems and core mechanics. The clever systems with tricks that mean you have to remember which combos cause maximum chaos, creates a issue when its more than one systems and you play all of them. A one type system which you can use to which ever would be good, and surprisingly not been considered before with so many RPG systems already doing the same. Advantages like having ‘all things zombie’ means that if you fancy a change from say British civil war you could add the zombie module and go for a different style for a game. In a way its like a jigsaw puzzle with new modules just adding to the grand picture. It also opens up a franchise system, with companies making use of the core system and developing a new game specific background module for themselves. Great for starter companies. So good things to come out of it. This is the kind of system that would work wonders with someone like Abbadon books and their ‘Tomes of the Dead’ or ‘The Afterblightt chronicles’. I’ve been looking for some good skirmish rules for a while now to use in a LOTR setting. We play mass battle LOTR using a slightly altered version of Mantic’s KOW rules (which we dubbed King of the Rings) and this works splendidly. With Eternal Battle I’m guessing it will be easy enough to place the human armies (Gondor, Easterlings etc.) but would it be possible to find something to use for races like Elves or Orcs or would a fantasy ‘Twist’ be required? Sounds pretty awesome! Can’t wait to hear more! This would be the holy grail of wargaming, one system that can cope with anything. Steve Jackson Games tried it many years and failed and some people are opposed to the very idea, arguing that such a rule system would be so generic it would miss important details. It is going to be interesting to see how it goes and I do support the idea. Technology changes but people less so. In terms of small unit tactics, modern to me is 20th century, mainly WWII on.